Connect with fellow educators and school leaders in systemic planning around the effective use of technology and digital learning! Collaborate with and be inspired by educators and students across the state! Immerse yourself in ideas, strategies, and resources! Meet face-to-face with well-respected professionals in your field! Stay for Waterfire at dusk! Don't Miss A Thing at the Conference! Questions about using the event app? Click here for helpful answers to all of your event app questions! Join teams of educators and decision makers working hard to accelerate digital learning in schools across the state. Engage and interact in conversations with over 1000 attendees including teachers, students, technology coordinators, staff developers, administrators, policy makers, professors, government and industry representatives, as well as national leaders in educational policy and practice. RIDE invites corporations, foundations, and nonprofit organizations providing services to the K-12 education sector to join more than 1000 participants in a conference focused on developing digital learning ecosystems across Rhode Island. Exhibitor and Sponsor Registration is now closed. THANK YOU to all of our great Exhibitors and Sponsors for your support! RHODE ISLAND IS READY TO ACCELERATE! Thank you to all of our Exhibitors and Sponsors! There is a healthy and growing appetite to create robust, digital learning ecosystems in schools throughout Rhode Island. Recognition - Take advantage of the broad recognition opportunities that exhibitor packages and sponsorship offers to corporations, foundations, and non-profits providing services to the K-12 education sector and e-learning. Project 24 provides tangible assistance to school districts for systemic planning around the effective use of technology and digital learning to achieve the goal of "college and career readiness" for all students. 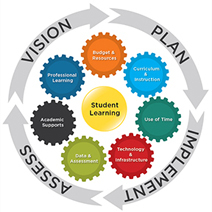 It is a one-stop shop of comprehensive district-level planning tools, expert advice, creative ideas, and tangible suggestions from experienced education experts and nonprofit education membership organizations. For which elements has the school or district already made significant progress? What needs more attention and should be a focus in planning? If not yet prepared to discuss key issues identified within the element, what can be done to increase knowledge and skills? Plan to achieve those goals. Serious Challenges Facing District Leaders - Infographic provides an overview of the challenges and the elements that leaders must address in responding to the challenges. The following schools and districts have defined their own goals for their digital learning transition and developed strategies for addressing the challenges. Which ideas might apply in your school?